Kontron has announced the imminent launch of a new embedded mini PC that will take the form of the Kontron KBox B-201-CFL which will be equipped with a choice of powerful 8th Generation Intel Core i3/i5/i7 processors any small form factor measuring just 190 x 60 x 190 mm. 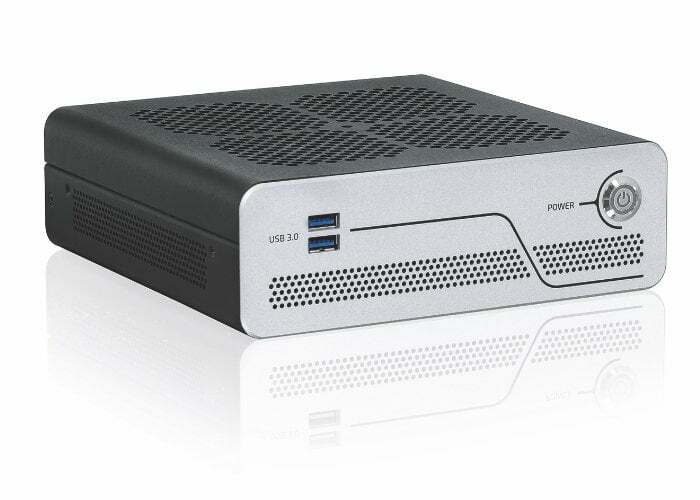 The outer casing of the mini PC is constructed from hot-dip zinc coated mild steel sheet (EN10215) and aluminium enabling it to be operated from 0 to 45° C. Features of the many PCs include a DisplayPort V1.2, which can operate up to four displays as well as a DVI-D connector.Connectivity on the mini PC takes the form of three USB 2.0, two USB 3.0, two USB 3.1 Gen 1 ports and two Ethernet ports 10/100/1000MBit/s (WoL) are available. The existing RS-232 interface can be used, for example, to connect POS terminals and measuring instruments. Storage on the Box PC can optionally be equipped with a Mini PCIe plug-in card in half-size format and a M.2 SSD (2260/2242), or a Mini PCIe plug-in card in full-size format in combination with a M.2 SSD (82242). The Kontron KBox B-201-CFL supports Windows 10 IoT Enterprise LTSB or Yocto Linux operating systems. Unfortunately, no information on pricing has been released as yet. For more details jump over to the official product page by following the link below.